Marc-Andre Fleury got a surprise start in Game 1 of the Eastern Conference Quarterfinals against the Columbus Blue Jackets after anticipated starter Matt Murray had to bow out during warmups with an undisclosed injury. 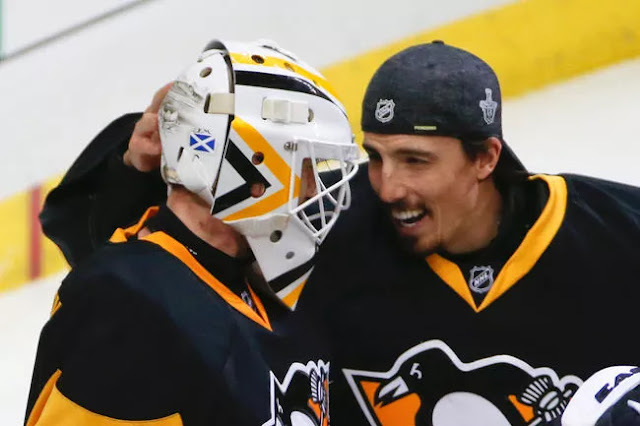 Despite expecting to sit at the the end of the bench as a spectator for the evening, Fleury played extremely well in helping the Penguins overcome a poor 1st period to notch a 3-1 win to kick off their defense of the Stanley Cup. Yesterday, Medina wrote about the ongoing goalie controversy in Pittsburgh, which prompts me to ask - what goalie controversy? It's certainly not coming from Mike Sullivan, who has started Murray 47 times since returning from an injury suffered in the World Cup, as opposed to the 25 starts Fleury received in the same time frame. There's no controversy from watching the two play, or the numbers they've posted in their time on the ice. And while fans are understandably happy to see a player who has meant as much to the franchise as March-Andre Fleury has find postseason success, there's no groundswell of support suggesting that the fanbase believes Sullivan has erred in his decision making. Because since Sullivan has taken over, the level in play between the two goaltenders hasn't been particularly close. 56 goalies have played at least 1,500 minutes total since the Penguins promoted Mike Sullivan from Wilkes-Barre/Scranton, and there couldn't be a clearer difference between Matt Murray and Marc-Andre Fleury, both how they compare to each other and how they stack up against their peers. Murray has not only played great for a 22-year-old "rookie"; every indication is that he'll go on to have high-performing prime years that could potentially see him in contention for the Vezina Trophy. It's not an indictment against Fleury; he's simply a mediocre goalie that has deservedly taken a seat to someone much better. It would be shocking to see Fleury hold onto the starting job after Murray has been cleared for action, but if he can continue to play well he's going to give the team the ability to make sure Murray is fully healed instead of rushing back at less than 100%. But there is no controversy in the crease - this is Matt Murray's team.